1958 Alfa Romeo Dauphine Owner's Manual. 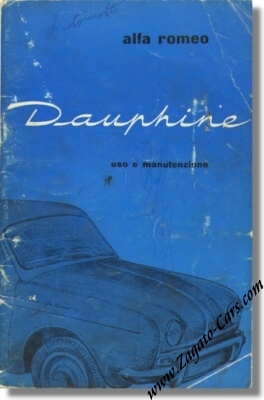 Vintage 1958 owners manual for the Alfa Romeo Dauphine. It measures some 6 x 8 inches or 15 x 20 cm and counts 46 pages. Print reference: None, printed by Imprimerie P. Dupont, Paris, France. Heavily used with plenty of "battle scars" but EXTREMELY rare, even in this condition.